One in 10 older people go on a diet and exercise regime before jetting off on holiday - yet a fifth of them forget to take out travel insurance. 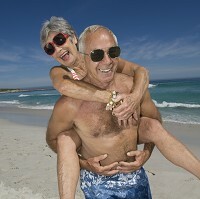 New research reveals that the over fifties are just as keen as the younger generation to make an impression on the beach. Women in this age group are three times more likely to undergo pre-holiday routines than men, with the quest for a bikini body beginning over three months before departure in the vast majority of cases. But while they're getting their hair done at the local salon or sunning themselves at a nearby tanning parlour, almost a fifth are forgetting to purchase any travel insurance and a quarter are leaving such cover until the last minute. To ensure you don't miss out on all the benefits that travel insurance brings, book from a range of policies to designed to suit your needs via World First. Older people in the North East are the most eager to look good for the beach, going out of their way to tone up or trim down in the months before take-off, while women are far more likely than men to get a holiday hairdo. In terms of travel insurance, those in the West Midlands and Wales are most likely to travel without cover at all. Londoners, meanwhile, are the most likely to wait until the last minute to take out cover, leaving it until the last couple of weeks. The Saga research also reveals that older people like to brush up on the culture and traditions of the place they're heading to, with over half of them reading up on such things prior to departure. Just under half buy a book for the journey, while a third take the time to learn some foreign phrases.